Home / A new lulu for a new year! What do you think? Let’s stitch a brand new lulu mypinkturtle canvas as the first mystery class of the new year! We all love lulu so much, and this canvas is certain to be even cuter once we add threads, beads and stitches to it. Imagine the possibilities! 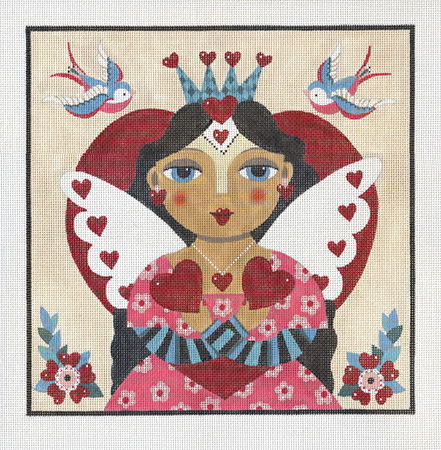 Lulu’s angel queen is 10 x 10 handpainted on 18ct. We will stitch her in 3 lessons either in person or long distance. Class dates are January 29, February 12 and 26, 2017. We’d love to have you join us. Sign up online or give us a call at 410.296.0405. P.S. We have new super cute snap trays just for this class. Can’t wait to show you. « Previous: Artemis, Oh Artemis! Wow…..another new canvas gets a complete stitch guide. Meanwhile, "mysteries with a twist" that are advertised as getting lessons every 3-4 months are actually getting lessons close to once a year! TWO AND A HALF YEARS have gone by, and we're only half done with Row of Ladies II. This is criminal.